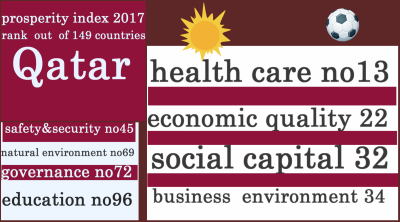 Qatar's best performance in a global chart is the health service . Ranks 13 out of 149 countries . What about other Gulf countries ? UAE 's health care ranks 25 out of 149 , Kuwait 33 , Oman 29 , Saud Arabia 34 , Bahrain 28 . Education ranks : UAE 65 , Bahrain 61 , Kuwait 94 , Saudi Arabia 64 , Oman 79 .